The healthcare industry is growing at a rapid pace and undergoing some of its most significant changes as the use of electronic health records increase. Designed for technologists or medical practitioners seeking to gain entry into the field of healthcare information systems, INTRODUCTION TO HEALHCARE INFORMATION TECHNOLOGY teaches the fundamentals of healthcare IT (HIT) by using the CompTIA Healthcare IT Technician (HIT-001) exam objectives as the framework. It takes an in-depth and comprehensive view of HIT by examining healthcare regulatory requirements, the functions of a healthcare organization and its medical business operations in addition to IT hardware, software, networking, and security. 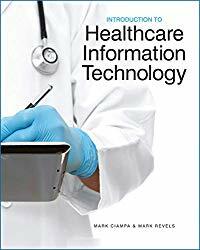 INTRODUCTION TO HEALHCARE INFORMATION TECHNOLOGY is a valuable resource for those who want to learn about HIT and who desire to enter this growing field by providing the foundation that will help prepare for the CompTIA HIT certificate exam.